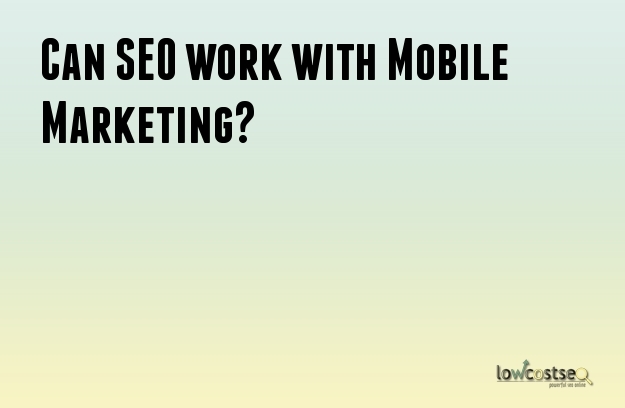 Can SEO work with Mobile Marketing? With the rise of Mobile Marketing, can SEO still work? SEO has always been the focal point of online marketing campaign over the past decade. The increase in usage of mobile phones over traditional computers for online browsing has shifted the landscape for businesses to gain online visibility. Thousands of mobile applications are released daily to deliver content directly to the users, as opposed to them searching for it. These mobile applications are being developed to serve as a supermarket, providing a plethora of information to eliminate the need for users to search out of the app. Facebook, Instagram and Twitter have been very successful channels for online marketing, with the easy-sharing buttons enabling content to be shared virally in a matter of minutes. This has seen businesses abandoning the SEO for paid advertising as they compete for ad spaces on social networks and mobile ads. With more than 70% of mobile users turning to applications and social networks for information to reach them, is SEO still relevant? It is evident that SEO has not been able to play a prominent role in mobile marketing, with SEO accounting for less than 20% of organic search results on mobile devices. Rather than viewing Mobile Marketing as a direct threat to the relevance of SEO, should businesses embrace this change and use it to complement their marketing campaigns instead? When online marketing was first birthed, offline marketing (e.g. distribution of flyers) was carelessly deemed as obsolete. The emergence of mobile marketing means that the room to gain more online visibility has expanded. Google+ is built to rival Facebook as a social network, offering enhanced capabilities with the integration of Google’s current applications. This can however be seen as a new channel for businesses to capture another market to promote their products, rather than choosing one over the other. Businesses have to consider the profiles of mobile users and the various patterns of mobile surfing before jumping to any conclusions. We have to understand that online browsing on mobile phones is often restrictive, with features being eliminated to enhance the browsing experience. In some instances, content being offered by businesses can only be viewed accurately on a desktop browser, hence augmenting the importance of SEO in getting readers to it. News Websites identified the need to break their content down into various forms to stay relevant and ahead of their competition. From sharing images of events on Instagram, to sharing a condensed 6-sec news clip via Vine, News agencies hope that by giving the readers a snippet of the news, they would eventually be lured to their main websites for the complete story. Mobile surfing is also often seen as a fast way to retrieve information for a quick-fix solution. Surveys have shown that searching via Desktop browsers (via Search Engines) is still the preferred way when users require complete and lengthy information. Businesses of various scales should see the emergence of mobile marketing as an additional channel for them to get their messages out, not as a sole focal point of their marketing campaigns. While it does not spell the end of SEO in general, its relevance and role have to be redefined to achieve its ultimate purpose – to gain online visibility. With internet marketing being the buzzword of modern day businesses, the leading SEO companies in the UK are offering very efficient and affordable services that keep you constantly afloat in the ever growing tide of contents. There is nothing like internet marketing when you want to tap the global market. Internet has opened up new vistas to market your product in the ever growing market and global businesses are relying more on internet marketing than other options like giving advertisements in print media or resorting to its audio visual counterpart. But to remain visible in the internet, search engine optimization has to be done carefully with the rightly chosen keywords and quality content so that your website is given a higher listing whenever someone looks up for contents that matches your product. Search engine optimization in this ever growing tide of content is a job meant for the professionals and luckily many leading companies in UK are offering first class services that you can rely upon. Getting the right phrase or charting a relevant content is no easy job. It requires years of experience and expertise to understand which keywords would work best on the internet so that whenever someone is searching for a product or service that matches your description, the search engine would automatically show your site in the first page of its listings. It is more than a simple and straight forward promotion, as the search engines are more interested about the quality and viability of the content that would help its users. There are many malpractices practiced by unethical content writers who use unnatural means to keep afloat in the world of content. They should be carefully avoided as honesty is the best policy. Sooner or later, the search engine weeds out the malpractices and the site may be penalized for using such unfair means. Such untoward incident can be clearly avoided if one chooses the right company and fortunately the leading SEO companies in the UK offer totally ethical means to achieve a higher ranking in the search engines. Achieving higher ranking also means that the experts are well versed about the customs and traditions of any particular region, so that they come up with the right phrase or keyword. A constant acquaintance of the popular vocabulary of the internet users becomes an asset in this job and the content would be as such that it would rather help your client to choose the right product rather than dictating on which product to buy. The leading SEO companies in the UK realize that consumer behavior is changing over time and to understand the mindset of the potential client, an insight of their psychic make up and needs are essential. Lastly, it may be mentioned that the SEO packages offered by the Leading SEO companies are quite affordable and most of them only charge you when you have achieved the desired results. Lowcostseo.co is a UK based company that stands as a vanguard in terms of providing marketing ideas and strategies that are at par with the latest social marketing trends and helps you to gain insight about the latest trends of consumer behavior and their purchasing preferences.